Above all, holiness. . .
Jesus and his mother mingle with the wedding guests. Near the end of the party, Mary reports to Jesus that the good wine has run out, “They have no wine,” she says. Jesus, being the good son, says, “Woman, why turn to me? My hour has not yet come.” Now, you can just see the look on Mary’s face. That look mothers get when a son gets a sassy mouth. No doubt she pinched her lips just a bit, took a deep breath, maybe rolled her eyes, and said to the servants, “Do whatever he tells you.” Jesus proceeds to change six stone jars of water into high quality wine. John writes: “This was the first of the signs given by Jesus: it was given at Cana in Galilee.” To mark his entry into a public ministry of teaching, preaching, and healing, our Lord chooses a wedding feast, the party after the formal liturgy to claim his divine Sonship. Why a wedding feast? Of all the opportunities to announce his public ministry, why does he jump at this chance to reveal himself? Well, Mary is pushing him to “do something.” There's a crowd with people from all over town. Everyone is in a celebratory mood. All true. But don't overlook the obvious answer: the wedding guests needed wine! The Lord provides, and he provides more than bare necessities. Let's examine what Jesus does when he changes water to wine. What happens? Yes, he changes water to wine. Yes, he obeys his mother. Yes, he reveals his power. And he does all this in order to announce the start of his public ministry. More importantly, he stakes a claim to his divine Sonship by changing that which we need simply to live into that which we need to live well. He shows the wedding guests and all of us that he comes to change survival into celebration, changes “just getting by” into thriving on God's abundance. In the next three years, Jesus transforms the Law of stone into the Law of love; he transforms the sacrifices of the temple into the one sacrifice of the cross; he transforms suffering and death into joy and everlasting life. The Wedding at Cana is transform from just another nuptial celebration into the unique sign of Christ's Sonship and serves as the beginning of his wedded life to the church! The physical miracle of water changing into wine is also a sacramental sign, evidence of God's grace working in the world to seduce us and draw us into the life of the Spirit, a life of holiness. If we take the miracle at the wedding feast of Cana as a sign that God wants us to celebrate and thrive and not just get by and survive, we come closer to understanding the nature of the Church as Bride. Where do we find the bond of love and self-sacrifice? Where do we find the clearest declaration of God's intention to bring us back to Him? Where do we go to receive His blessings and to give Him thanks and praise? The one Body, the Church, His Bride. We find all these—love, self-sacrifice, blessing—we find them all here. . .among brothers and sisters, among the worst and least of God's children, among the best and greatest of His saints. Jesus doesn't reveal himself as the divine Son to a clique, or a secret society; nor does he hoard his power and dole it out sparingly. He spends it. . .extravagantly, at a party. He creates a luxury and helps the guests enjoy God's abundance. Think of Mary Magdalen and the expensive perfume oil she pours out on Jesus' feet. Think of the 5,000 who feast on a few fish and a few loaves of bread. Think of the hundred-fold harvest reaped from a single seed. Think of the Cross and the expense of your redemption, Christ's blood poured out. For his Bride, the Bridegroom desires joy, peace, prosperity. And above all, holiness. NB. I like this homily. . .but it is also a little. . .stiff? formal? too ____? Not sure. Anyway, it's much better than yesterday's sad attempt. John asks, “Who indeed is the victor over the world but the one who believes that Jesus is the Son of God?” Those who believe that Jesus is the Son of God are victors over the world? Hmmm. . .would Stephen, who was stoned to death, say that? Would the Holy Innocents say that? Would John the Baptist, his head resting on a plate, say that? Would the 40 or so Nigerian Catholics burned to death by Muslim terrorists in their church after Midnight Mass say that? If these believers were also victors, what sort of victory did they win? John says that those who believe that Jesus is the Son of God win a victory over the world. But in all these cases of brutal martyrdom, it appears that the world won a decisive victory over the believers. And it appears so b/c the world considers death a defeat. We do not; that is, we do not consider death a defeat b/c death is not an option for the believer. Of course, we die. Our bodies give out, surrender to disease and accident. But b/c we believe that Jesus is the Son of God and that he lived and died for us, death is just a dramatic transition to an eternal life. God testified through His Son that by the Spirit, water, and the Blood of Christ, we are given “eternal life, and this life is in His Son.” We live our lives in His Son and not in this world, therefore our deaths are not of this world. We die in Christ and rise again with him. To mark the transition from living in this world and living in Christ, we receive the grace of baptism. Washed in water made holy by the Spirit, we become blood brothers and sisters of the Son, the adopted children of the Father and co-heirs to His kingdom. Baptism not only joins us to the Holy Family by freeing us from the slavery of sin, it also makes us ready to live holy lives, lives constantly and consistently guided by the presence of the Holy Spirit. With the Holy Spirit and our family in Christ, each of us progresses toward holiness according to our gifts, enjoying the Lord's perfecting love and sharing that love freely and generously. The more we share our gifts, the more we use our gifts for the benefit of others, the more perfect, the more Christ-like we become. If Christ dies and rose again, so will we. If Christ will return, so will we. Death is not defeat, rather death is defeated through the re-creating love of God and our hard work in spreading that love. John the Baptist says, “I have baptized you with water; [Christ] will baptize you with the Holy Spirit.” John baptized for repentance, turning from sin. Christ baptizes for life after repentance, the life of holiness. If the waters of baptism wash us clean, then the fire of the Spirit keep us clean. By constantly and consistently placing ourselves in the way of grace through the sacraments—especially confession and the Eucharist—we renew and reinforce our hearts and minds, leaving ourselves open and free to the guidance of the Spirit. This openness and freedom leave us vulnerable to the world's spite and in danger of ridicule and violence. So be it. Even as we live in this world, our eyes are set on world greater and grander than anything possible in this one. Not a “pie in the sky by and by” world, but the perfection of creation accomplished through Christ; the world as God made it to be. What we do with God's gifts adds to the world's inevitable perfection, brings it and us ever nearer to a holy end. What will you do today, what gifts will you use today to bring yourself and the rest of us closer to our Christ? Who will you forgive? Who will you love? To whom will you say, “Whoever possesses the Son has eternal life”? An Italian photojournalist documents how his colleagues manufacture Mid-East conflict for $$$. Salvation Army supports abortion. Wish I had known this before Christmas. Not.One.Dime indeed. Archbishop Chaput is selling his mansion. Good for him. Unless there's some sort of historical significance to an episcopal residence (e.g. the Vatican apartments), I say sell them all. Oh, how The One has fallen. . .students laugh at B.O. Harpoon snail swallows a fish whole. . .there was a Star Trek episode with a space creature that reminds me of this snail. Future priest saved baby Hitler from drowning. . .that was also a Star Trek episode, wasn't it? Or maybe that was Twilight Zone? LAT: "[Bishop] Gabino Zavala had a high profile in the archdiocese. His parenthood violates church celibacy laws." No, his fatherhood violates Church discipline with regard to chastity. Unless he married the mother of his children, he didn't violate his promise of celibacy. Most unexpected question of the year? Is the Nanny State a Lesbian? Uh??? 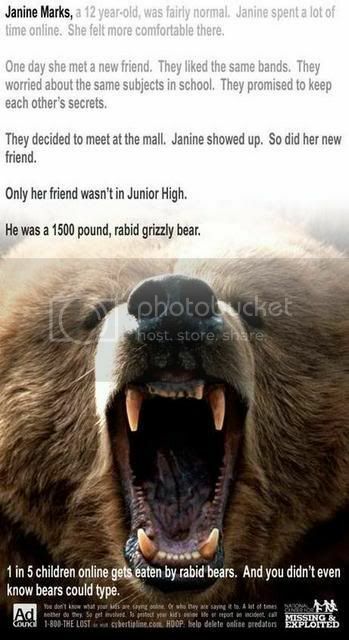 Something you didn't know about grizzly bears. Philip proves to be an useful instrument in Nathanael's search for God. But it is Nathanael's sincerity in searching for God according to the Law of Love that gets him recognized by the Christ. Had Nathanael followed the Pharisees and made his search into a public drama, would Jesus have called him “a true child of Israel”? Not likely. Nathanael searches for the truth in love and does so without pretense or covert motives. He loves his God and acts accordingly, drawing the attention of the Christ not a crowd. When Christ recognizes Nathanael as a true child of the Law, Nathanael recognizes Jesus as the Christ. And having seen the Christ, Nathanael is ready to follow him and lead others to him. But let's not minimize Philip's ministry in this revelation. Philip is the one who says, “Come and see.” Philip is the one who leads Nathanael to Jesus. Philip acts in love and presents a searching soul to his Savior. Without Philip's invitation, without his apostolic call, Nathanael might never have met the Christ. Make it your ministry—as an apostle sent out—to call those to Christ who are most in need of love and mercy. The one question that seems to plague serious Catholics more than any other is: how do I pray well? This question comes after an admission that their prayer life is suffering from a dry spell or that they have more or less given up on prayer b/c the effort seems so fruitless. Generally, I direct these earnest folks to the first few paragraphs of Part Four of the Catechism (nos. 2559-2565) and urge them to re-think their theology of prayer; that is, I urge them to reconfigure their notion of prayer as a way of jump starting a more fruitful conversation with God. The author/source of this part of the Catechism (a Dominican friar named Fr. Jean Corbon) writes: "He who humbles himself will be exalted; humility is the foundation of prayer. Only when we humbly acknowledge that 'we do not know how to pray as we ought,' are we ready to receive freely the gift of prayer. 'Man is a beggar before God'"(2559). This is all well and good. . .and exactly right. But how do we do this? Knowing the theology of prayer is vital. Knowing the mechanics is also important. But being able to put the two together often eludes even the best pray-ers among us. Enter Fr. Martial Lekeux, OFM and his 1958 book, The Art of Prayer (original in French, L'art de prier, 1957), reprinted by St Pius X Press. The most impressive element of this book is its practicality; that is, its usefulness for daily prayer. Completely given over to the utility of prayer, Fr. Lekeux leads his readers toward a truly mundane practice of talking to and thinking with God. With chapters on private vocal prayer, public prayer, meditation, affective prayer, and prayers of simplicity, Fr. Lekeux offers the earnest Catholic a simple yet profound way to stay in the conversation with God w/o an elaborate imaginative structure (a la Teresa of Avila, John of the Cross, etc.). What you get are concrete suggestions for turning everyday tasks into moments of time with God. If you are looking for an instructive, orthodox guide to a better relationship with the Lord, this book is for you! If we needed a shorthand way of referring to this morning's gospel, we might call it “The Hand Off.” John “hands off” two of his disciples to Jesus. We could also call it “The Hand Off Plus One” b/c not only does John hand off two of his students to Jesus but one of those students invites his own brother to join the class. We now have the kernel of apostles—three guys sitting at the feet of Jesus ready to hear the Word and obey. We might wonder why this seemingly insignificant scene deserves its own day in the lectionary: why do we spend time mulling over how two of John's disciples and Simon come to meet Jesus? Why is it important that we know something about how Jesus came to collect his first three disciples? What's striking about this scene is its ordinariness, its everydayness. No angels, no bolts of lightning, no burning plant life booming out a celestial voice. Just one teacher introducing his students to another teacher. The extraordinary part of this scene is how John introduces Jesus. Jesus walks by and John proclaims, “Behold, the Lamb of God!” Without further explanation or discussion, John's disciples veer off and follow Christ. Simon joins when he is invited by Andrew. The kernel of apostles is formed by a prophetic proclamation and a charitable invitation. This is how the Church is founded, thus this is how the Church grows and thrives. John's proclamation should be very familiar. After the host is broken at Mass, it is raised above the chalice and John's proclamation is repeated, “Behold, the Lamb of God!” Christ, truly present on the altar, is broken for us, and his broken presence, once announced, is answered, “Lord, I am not worthy that you should enter under my roof. . .” Acknowledging our own brokenness, we say, “. . .only say the word and my soul shall be healed.” When we take his Body and Blood into our own bodies, we are healed. He has spoken the Word of healing that both restores our spiritual health and binds us one to another as one Body. In the same way that the first disciples meet the Christ at John's proclamation, so we too meet the Christ at the altar, receive our salvation, and give him thanks for bringing us into the Holy Family. What's left for us to do? What did the men who met Jesus on the street do? They invited another. God's goodness and beauty are diffusive; that is, by His very nature, all that God is is distributed, spread out, freely given away. When we use the word “grace,” we mean “gift,” a freely given good. God's grace is the gift of Himself through Christ Jesus. So, when we receive Christ's Body and Blood in the Eucharist, we receive God Himself. We become more like Christ, more Christ-like. Being Christ-like means living sacrificially, giving away and giving up for the sake of another so as to grow in holiness. Andrew, for example, did not squirrel away his knowledge that Jesus is the Lamb of God, the Christ. He and the other disciple did not form a secret society and hoard Jesus' teachings. Simon is invited into the classroom and Jesus names him “Cephas,” Peter. Because they distributed the Good News, spread it out, Peter becomes the Rock upon which the Church on earth is built. I've updated the Books & Things Wish List to better reflect my current assignment as a parish priest. You really can't do better than BXVI for theology and Church history, can you? Imagine the reaction from the Left if "W" had signed a bill allowing the military to indefinitely detain American citizens suspected of terrorist activities. Since B.O. signed it. . .cricket concerto. As the "state-run media" becomes increasingly propagandistic the New Media does the hard job of actually gathering the news. Thus, the clamoring from the SRM for more gov't $$$. This development in American culture is worrying all the right people. How many of you saw folks texting/playing games on their mobile devices during Midnight Mass? B.O. is running a "post-modern campaign, in which there is no objective truth but simply narrative." Well, he is a product of cultural Marxist "thinking." Excellent post on St. Basil the Great. Find out why he's titled, "the Great." Too bad we can't clone him and elect him Pope! Connecting an ancient heresy with its postmodern cousin: Arianism & Materialism. A letter to Fr. Z. about a visiting priest who trashes the new translation of the Missal in front of a CCD group. Expect more of this sort of thing. Fascinating post on the meaning of "freedom of the press." Meanwhile, in _______. A few national stereotypes. It's the fiber. . .I just know it is! Back to 338 lbs. I blame it on the fiber pills. Off to SubWay for a chicken beast sub on wheat. . .no mayo. NB. If you listen to this Mass all the way through, you will notice that I messed up the offertory prayer. For some strange reason I flipped to the propers for the Epiphany and read the opening collect. I was 2/3 of the way through it before I realized that I had messed up. Oh well. Ecclesia supplet! As the early Church struggled to understand God's Self-revelation in the only languages they knew—4th century philosophical Greek and imperial Latin—three prominent figures rose to the occasion and provided believers with the means to glimpse into the nature of the divine: Basil the Great, Gregory of Nazianzen, and Basil's brother, Gregory of Nyssa, the so-called Cappadocian Fathers. All three of these men left the Church with a treasure trove of writings that parse the delicate terms we still use to describe the Blessed Trinity, the Incarnation, the life of holiness, and the general rules for monastic life. In every way that matters, these saints of the eastern Church were prophets for the Lord. They reached to understand divine revelation and put their understanding to work for the good of God's people. Today, we honor Basil the Great and Gregory of Nazianzen by asking a question that has been often asked but rarely answered adequately within the living tradition: what does it mean for one of us, or all of us together to be prophetic? That is, if we are exhorted to be prophets for the Lord (and we are! ), what exactly are we being asked to be and do? When the priests and Levites ask John the Baptist, “Who are you?” he answers enigmatically, saying, “I am not the Christ.” This is an enigmatic answer b/c they did not ask him if he were the Christ. He answers by telling them who he isn't. They ask again, “Well, what are you then? Elijah? Are you the Prophet?” He says, “No. I am not.” No fewer than three times does John deny being someone else; three times he says in effect, “I am not he, I am not that.” Aggravated with his obstinacy, they finally blurt out, “Who are you, then? What do you have to say for yourself?” John's answer defines what it means to be prophet of the Most High: “I am the voice of one crying out in the desert, 'Make straight the way of the Lord. '” We have to notice here that John says that he is “the voice of one crying out.” He doesn't say, “I am a voice crying out” but “I am THE voice of ONE crying out.” In other words, John is claiming to be the voice of another, the voice that cries out what this other one wants cried out. Prophets surrender their voices to God and speak His Word in order to prepare the way for His coming. The Church is plagued by self-anointed prophets who speak on behalf of their personal agendas. Appointed to the role of prophet by nothing more than their private sense of urgency to fix problems only they can see, these voices no more speak for God or the Church than do those who hope to see Christ's work destroyed. Genuine prophets do not set themselves above the Church in order to light a revolution in their own image. Genuine prophets of the Lord cry out His Word within the Church in order to prepare us for His arrival among us. Genuine prophets of the Lord give their obedience to only one agenda: the necessity of repentance and forgiveness in our preparation for the coming of the Lord. God's Word must be heard and His saving works seen so that those who can see and hear will know the way to prepare for the consummation of His kingdom. As baptized members of the Body of Christ, as priests, prophets, and kings, we are vowed to both repentance and forgiveness, and we are vowed to speaking His Word and glorifying His saving works. Like Elijah, John the Baptist, and the Blessed Mother, we point toward the Lord, never to ourselves or our personal agendas, always toward the Lord, and announce His coming among us. To be a prophet is to cry out in the voice of another, the voice of Love Himself.